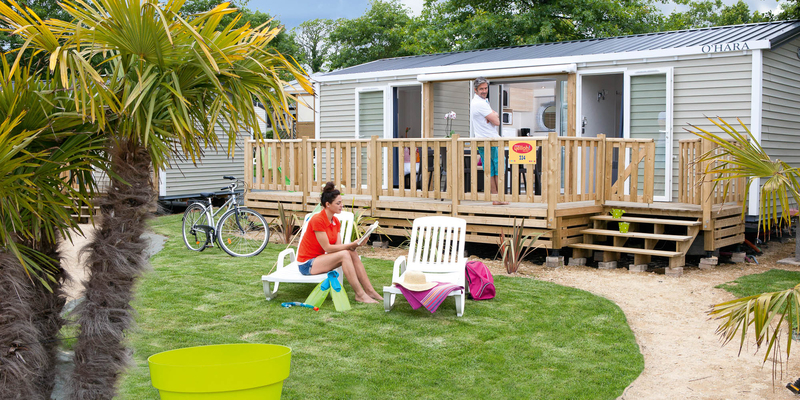 Traditional camping enthusiasts, choose a 3 flower pitch in Le Port de Plaisance for your next holidays in Bénodet. With a minimum 100 m² surface area, our pitches are connected to water and have a 6 amp electrical connection point. Ideal to relax and spend unforgettable holidays in the open air! With a surface area of 57 m², Key West Cottage with a Jacuzzi is the campsite's most spacious accommodation. It can accommodate up to six people in excellent conditions with its three bedrooms, three bathrooms and three toilets. Ultra high-end, this cottage is arranged in two comfortable, well-equipped and nicely decorated units. The terrace has a private Jacuzzi and the cottage is located in the heart of the Premium pedestrian area. •	living room with television, wifi, fitted kitchen with central island, sink, ceramic hob, microwave, grill, fridge-freezer, tableware, dishwasher, Nespresso, electric kettle, toaster. •	1 bedroom with 1 double bed 1.60 x 2.00 m includes bathroom with extra large shower, towel dryer, hair-dryer and private WC. •	1 bathroom with shower, towel dryer, hair-dryer and private WC. •	Electric convector heaters in all rooms. •	Wooden terrace with awning, garden furniture, 4 deckchairs and barbecue. PREMIUM services: Beds made on arrival, towels provided, end of stay cleaning included, Wifi access. Get ready for the magnificent views from Cap Deseo Cottage! A modern and up-to-date, premium cottage with a cosy interior! 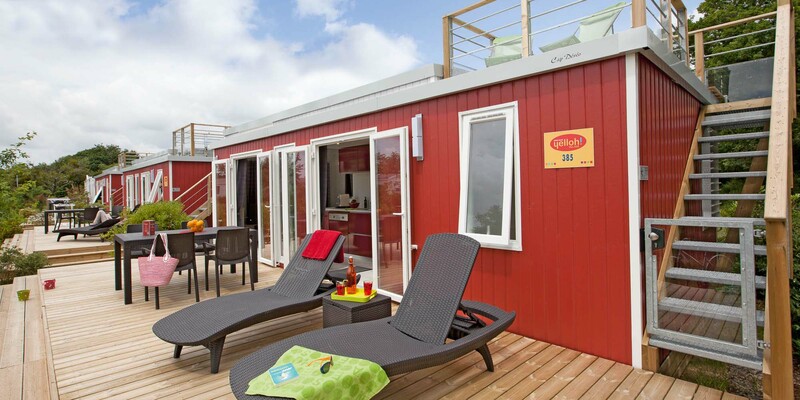 With its wooden terrace, sunbathing and second roof terrace giving a panoramic view over the surrounding area, Cap Deseo Cottage is the perfect mobile home for a unique experience with family or friends. •	Wooden terrace with garden furniture, 2 sun loungers, a parasol, airer and barbecue. 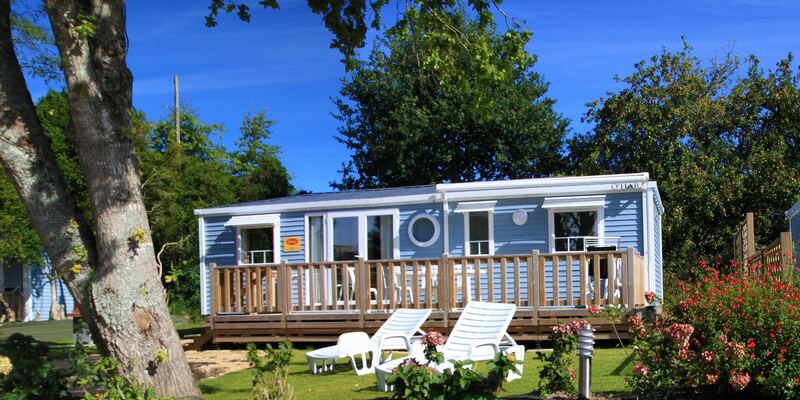 The campsite’s third Premium holiday rental, Cottage Plaisance has a surface area of 34 m² and can accommodate up to 4 people. Ideal for a family with two bedrooms, two bathrooms and two toilets, this cottage also has a wooden terrace and garden furniture. •	Semi-covered wooden terrace with electric awning, garden furniture, 2 sun loungers, parasol, airer and barbecue. Rated Premium the cottage Riviera accommodate up to 6 people with its three bedrooms and two bathrooms. It offers you real benefits for a successful stay : high standard of comfort, XXL spaces, brightness, summer kitchen open to the outside, intimacy of its large master suite. -Wooden terrace covered and closed by a gate, garden furniture 4 sun baths, clothes horse and barbecue. 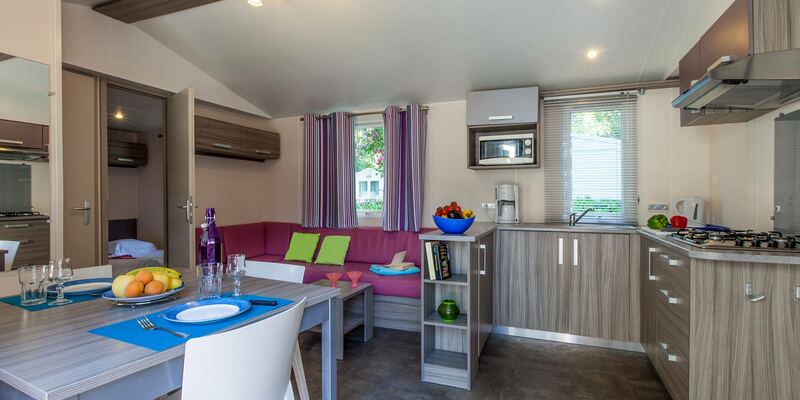 The ultra-modern Glénan Cottage appeared at Le Port de Plaisance campsite at the dawn of the 2018 season. This cottage can accommodate up to 5 people with its two bedrooms and 30 m² of living space, making it an ideal holiday home for a family. It offers top-of-the-range services and modern comfort. •	L shaped kitchen equipped with: Tableware, 4 ring gas hob, Fridge/Freezer, Dishwasher, Microwave/Grill, Coffee maker, Electric kettle. 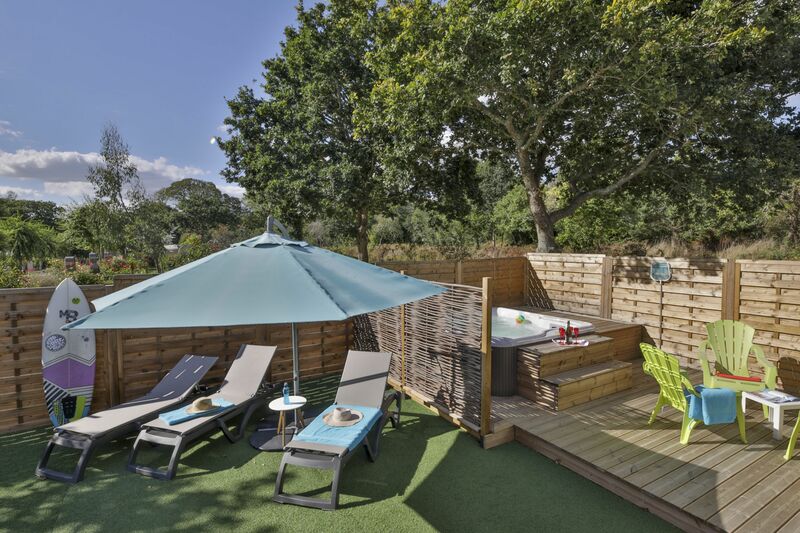 •	Wooden terrace with garden furniture, 2 sun loungers, parasol, airer and barbecue. What could be better than a farmhouse to combine the comfort of traditional accommodation in Brittany with the pleasures of camping at Le Port de Plaisance? This magnificent residence can accommodate up to 8 people. A holiday villa with four bedrooms, two bathrooms, two toilets, a kitchen, a large living room and a private garden. The surface area of the Longère is 160 m². •	1 bedroom with 1 double bed 1.40×1.90m and bathroom with shower, washbasin and hair-dryer. •	Private terrace with garden furniture, 2 sun loungers, a parasol, airer and barbecue. 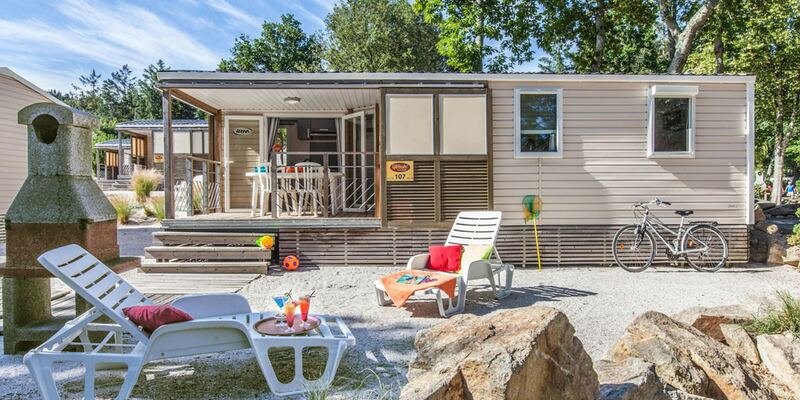 Enjoy the facilities, activities and services of a 5-star campsite in Bénodet while staying in a comfortable holiday home! With Penty, you will stay in a typical, 50 m², Breton-style accommodation with a living room on the ground floor and an American kitchen. Upstairs, two bedrooms and a bathroom are available. The Penty holiday home also has a private garden with garden furniture, deckchairs and barbecue. •	Private garden with garden furniture, 2 sun loungers, a parasol, airer and barbecue. Rated 4 flowers, Cottage Harmonie is one of those new generation mobile homes that offer their occupants top-of-the-range amenities and unbeatable comfort! Cottage Harmonie can accommodate up to seven people with its three bedrooms, two bathrooms and toilets. It also has a large living room and a fully equipped kitchen to allow you to have a more enjoyable holiday! •	Wooden terrace with electric awning, garden furniture, 2 sun loungers, parasol, airer and barbecue. This is the family cottage par excellence! With four bedrooms, the Family cottage can accommodate up to 8 people! There is a bathroom and a toilet. Its large terrace makes it easy to have a friendly and enjoyable meal, while the children run around in the surrounding garden! •	1 bathroom with washbasin, shower, hair dryer and towel rail. •	Semi-covered wooden terrace, garden furniture, 4 sun loungers, parasol, airer and barbecue. What could be better than a stay in Bretagne Cottage for your holidays in the Finistère? 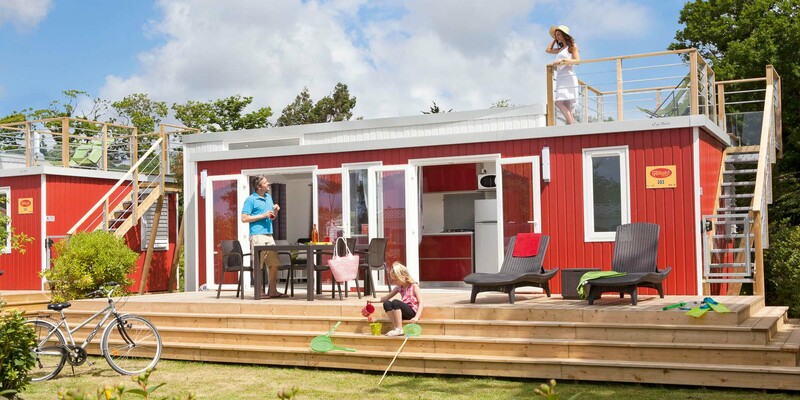 With 35 m², this accommodation can house up to 6 people maximum. It has three comfortable bedrooms, a fully equipped kitchen and a lounge opening onto a wooden terrace. Bretagne Cottage enjoys a green setting and an ideal environment to relax. •	Living room with TV + equipped kitchen: Tableware, 4 ring gas hob, Fridge/Freezer, Microwave/Grill, Coffee maker, Electric kettle. Relaxation Chalet has 32 m² of accommodation space. It can accommodate up to 6 people in 32 m² and includes, in addition to two large bedrooms, a bathroom, a toilet, an equipped kitchen and a living room. Its terrace is equipped and covered. Around the chalet, the surrounding garden is shaded by tall trees. •	Equipped kitchen: Tableware, 4 ring electric hob, Fridge, Microwave/Grill, Coffee maker Electric kettle. •	Semi-covered wooden terrace with garden furniture, 2 sun loungers, parasol, sunshade and barbecue. Suitable for people with reduced mobility, the Helios Cottage can accommodate 4 to 6 holidaymakers. With its 32 m² surface area, it has two bedrooms, a bathroom, a toilet, a lounge with sofa bed and a fitted kitchen. Specially designed to allow all its occupants to spend an exceptional holiday, Cottage Helios will certainly meet all your needs. •	Equipped kitchen: Tableware, 4 ring gas hob, Fridge/Freezer, Microwave/Grill, Coffee maker, Electric kettle. •	Wooden terrace with ramp access, garden furniture, 2 sun loungers, parasol, airer and barbecue. Fall under the spell of Cottage Armor! Accommodation of 30 m² for 5 to 6 people. Inside, enjoy two cosy bedrooms, a fully equipped kitchenette, a living room, a bathroom and a toilet. Outside, a terrace to use for bringing the whole tribe together for meals. The beautifully flowered garden, is equipped with two deckchairs. Ocean Cottage, rated 3 flowers, can accommodate a maximum of 6 people. •	Covered wooden terrace with sliding screen, garden furniture, 2 sun loungers, a parasol, airer and barbecue. Keltia Cottage, rated 3 flowers, extends over a floor area of 27 m². It can accommodate a family of 5 and has two bedrooms, a bathroom, a toilet as well as a living room and a fitted kitchen. Keltia Cottage also has a terrace and garden furniture. •	Semi-covered wooden terrace with garden furniture, 2 sun loungers, parasol, airer and barbecue. Le Patio Cottage may surprise you! It has two bedrooms and can accommodate 5 to 6 people. There is a bathroom, a toilet, a fully equipped kitchen and a living room. Outside, the covered terrace makes it possible to take meals out of the sun. There are two deckchairs for your use in the garden surrounding this top of the range cottage. •	2 bedrooms with duvets and pillows provided. •	Covered, wooden terrace with sliding screen, garden furniture, 2 sun loungers, parasol, airer and barbecue. Nestled in the woods, Cottage Cornouaille brings you the peace and quiet you've been dreaming of! Sit on the terrace of this charming 27 m² cottage and admire the wooded park that surrounds it! Cottage Cornouaille has two bedrooms, a bathroom, a toilet and a living room fully equipped kitchen. •	Living room with TV + equipped kitchen: Tableware, 4 ring gas hob, Fridge, Microwave/Grill, Coffee maker Electric kettle. •	Wooden terrace with garden furniture, 2 sun loungers, parasol, sunshade and barbecue. Perfectly adapted to glamping enthusiasts, the furnished Coco Sweet tent offers you the pleasures of outdoor living and the comfort of modern accommodation. With its bedroom, living room equipped with convertible benches and kitchenette, this tent furnished with a new generation of furniture can accommodate up to 5 people.